The book, "The Optical Corrections of the Doric Temple" has recently been republished at CreteSpace, and it is available at the Amazon both as a paperback and a Kindle version with full colour photographs. In my book: “The Optical Corrections of the Doric Temple” I have tried to show that the true meaning of the corrections is the intention to make the temple a unity although it was composed of many, so it would correspond with the ideal of the Doric polis, which was: a heroic autarkic unity composed of many equal, heroic and autarkic individuals. The most important component of the temple, the Doric column, is an entirely autarkic building component. Because of its round form, its tapering and entasis, its flutings and its capital, it cannot be connected with any other building component horizontally without violence. The most important problem facing the architect of the temple was: how to make a unity out of a row of these autarkic building components? In the above pictures we have two versions of a Doric temple front. The first one is depicted without any corrections, featuring thus the corner solution suggested by Vitruvius. It is easy to see that the tapering and entasis of the columns make the temple seem to fall apart on the upper level. The second picture with the corrections shows clearly the gathering and uniting effect of the corrections. The corrections were the most important tool of the architects to make the temple the true symbol of the city-state. Why did the architects of Doric temples never even experiment with different approaches to the basic conception of the Doric temple? This temple type was implemented in the seventh century BC, and it was one of the most insisting building types in the history of architecture, continuing its existence with little variation for several centuries. There is good reason to believe that the architectural intention behind this temple building was based on some very fundamental values of the Dorian city-states building these temples. In my book, “The Optical Corrections of the Doric Temple”, I have tried to show that this intention was based on the most fundamental ideal of these poleis, the ideal of “unity in plurality”, which was based on the heroic outlook inherited from the alleged heroic past and became common to all layers of the citizen-body along with the development of the polis. All the most important aspects of life were organized according to this principle: the polis itself, its military organization, the hoplite phalanx, and finally the Doric temple that was the ultimate symbol of the polis. According to this principle, the optical corrections can be seen as tools in the hands of the architects designing these temples to achieve this goal, to make the temple a unity although it was composed of many. All this points so strongly toward the suggestion that the Doric column would have been symbolizing the citizen-hoplite of the polis that there is even a good reason to ask whether there was any visual similarity between the Doric column and the hoplite soldier. 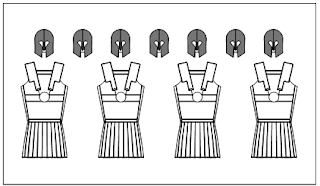 And indeed, the main body of the hoplite cuirass consisted of several plates of composite material. The groin, on the other hand, was protected by a double layer of groin-flaps, the second flap covering the gaps in the first. These flaps were made of stiffened leather, and they were permanently fastened to the bottom end of the cuirass. 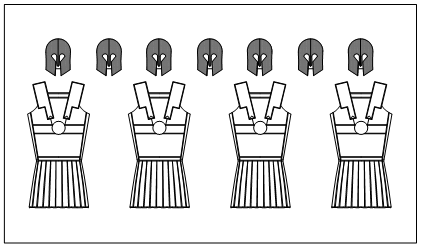 It may seem far-fetched to point out the obvious visual similarity between this part of the cuirass and the Doric column. However, the roundish, upward curvilinearly tapering form and the visual effect caused by the flaps reminiscent of the Doric flutings certainly makes one wonder, whether this similarity has had any effect on the development, and above all the persistence of the nature of the Doric column. Some might even be able to see a visual resemblance between the Corinthian helmet and the triglyph, see the picture. All this may sound fanciful to the reader. On the other hand, as an architect myself, I can assure that for most modern architects this kind of associations would be quite legitimate ways of searching motives for their design. Was Vitruvius right when he stated that the optical corrections of the Doric temple were meant to counteract optical distortions that would make the temple look faulty? The corrections were certainly used by the architects designing these temples to achieve a certain aesthetic goal; they were tools to help the architects to achieve the result that they felt to be correct. In this sense, taken strictly literally, we can say that Vitruvius was actually right; the corrections were indeed used to avoid some negative impression that was felt to be unacceptable. However, when we go a bit deeper and analyze his whole approach to the question, it appears in somewhat different light. Vitruvius was a typical Hellenistic pedant collecting and classifying ancient knowledge; understanding it properly was not always the prime goal. There is no reason to doubt that he had, indeed, been acquainted with the book written by Ictinus about the design of the Parthenon, and in this sense, he was most likely repeating Ictinus’ words. He lived, however, half a millennium after the flourishing of Doric temple architecture in an entirely different world with different values and ideals, and therefore these words became to mean different things to him. Vitruvius’ well known suggestion to solve the so called “corner conflict” of the Doric order actually proves beyond any doubt that he didn’t understand at all what the corrections were about. His corner solution with the half metope in the corner would turn the temple into a mechanical collection of an amount of similar columns; it would deprive of the temple its most important quality, which is unity in plurality; i.e. a unity although it was composed of many equal members (Doric columns). However, this ideal was the very reason for the invention of the corrections in the first place, and therefore the “solution” of Vitruvius would destroy the very essence of the Doric temple entirely. The origin of this “problem” lies in the fact that for constructive reasons the corner column should be placed in the middle of the architrave—in both directions. Further, the outermost triglyph was without exception placed in the corner—in both directions. On the other hand, the breath of the triglyph was smaller than the depth of the architrave because of what the triglyph in the corner was not situated in the middle of the column as otherwise was the rule. Accordingly, if one wanted to keep the rhythm even in the frieze, one had to make the corner intercolumniation smaller. If, on the other hand, one wanted to keep the rhythm of the columns even, one had to make metopes, triglyphs, or both broader in the corner. Based on the testimony of Vitruvius, this has been interpreted by scholars as an antagonism characteristic for the Doric order, which later by the development of working methods, constructions, and refinement of taste led to awareness of this “problem” and eventually to the abandonment of the entire Doric order.